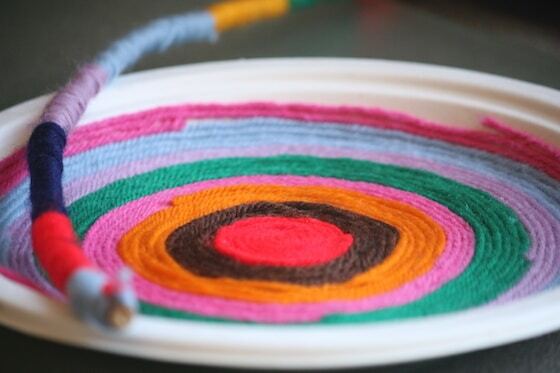 Kids of all ages will love these yarn art projects. 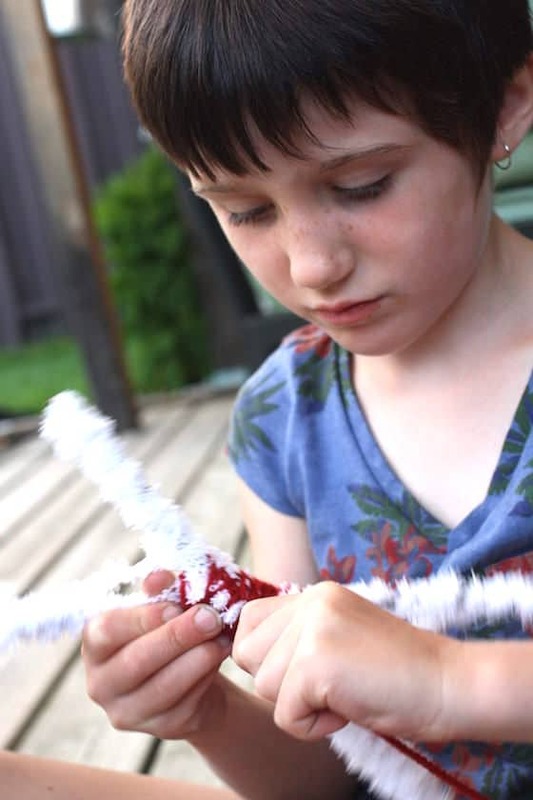 Younger children can make colourful twigs and sticks while tweens and teens will enjoy making their vibrant yarn art on a paper plate. The reason we’re crafting with yarn and paper plates today is because we’re working our way through the alphabet with paper plate crafts. “Y” is one of the few letters that we hadn’t tackled until today. We actually had a tough time coming up with a “Y” craft to make with a paper plate, but the other day we were going through all of the wool (or yarn) leftover from my knitting days, and this project came to mind. 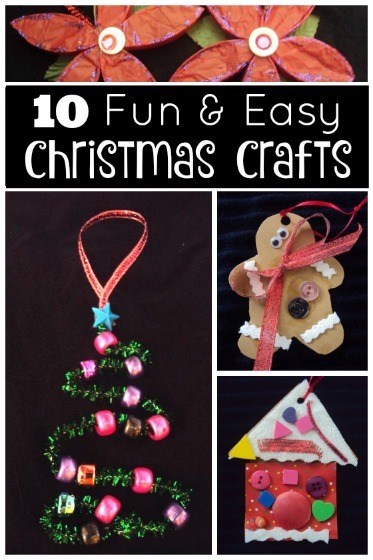 Older kids and even grown-ups will really enjoy this craft. I found the process to be quite relaxing and therapeutic. 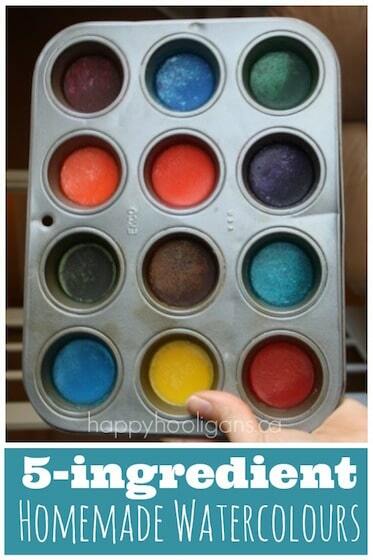 This would be a great activity for a bunch of crafty kids at a birthday party or an art camp. 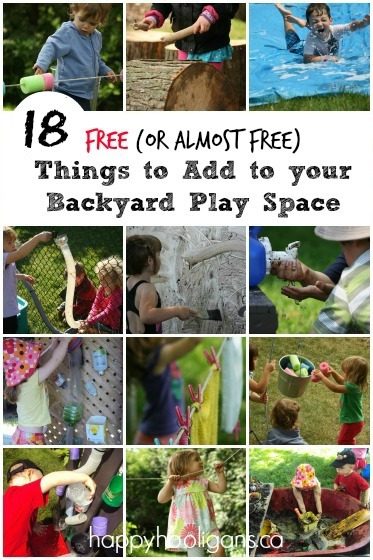 I can totally picture myseld as a kid, sprawled under a tree on a summer day, making these with my crafty friends. 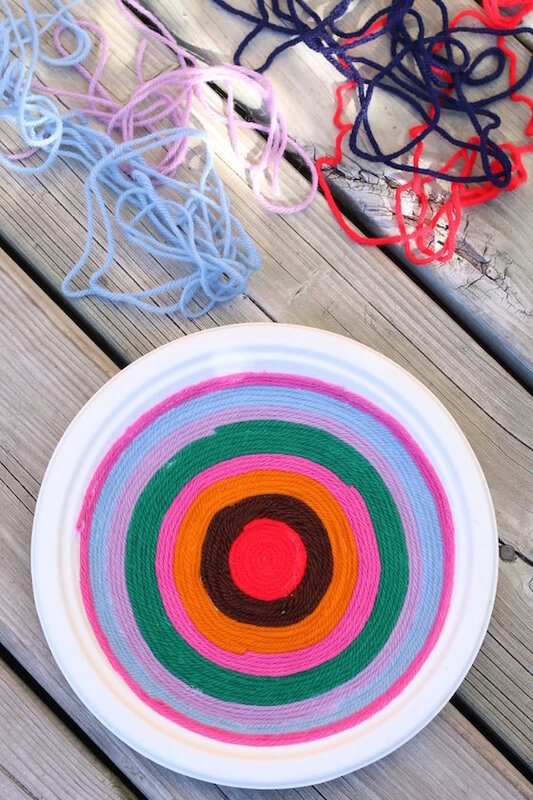 If your child is too young for the paper plate version of our yarn art, they might enjoy wrapping twigs or sticks. 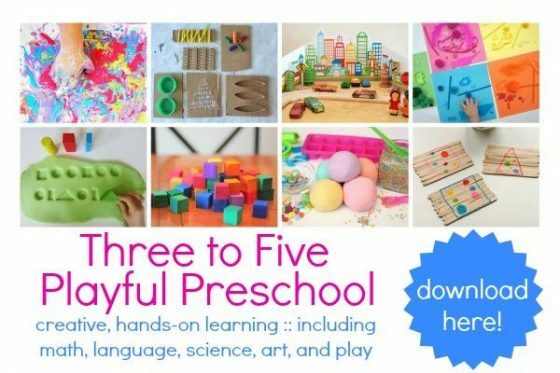 That can also be a lot of fun, and a great way to develop co-ordination and fine-motor skills. The results can be very pretty! 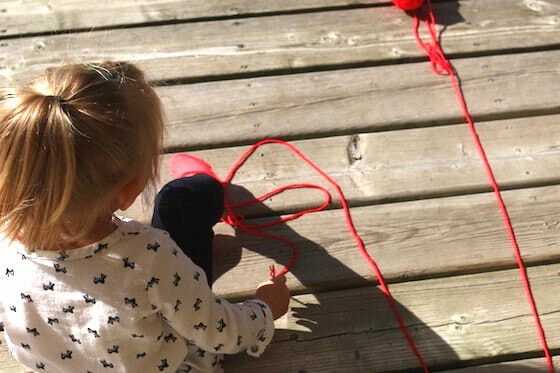 Toddlers can have fun making simple designs on paper with their yarn, or large designs on the ground. Begin by applying a thin layer of white glue to the surface of your paper plate. You can use a paintbrush to do this, or you can just drizzle thin squiggles all over your plate. You may need to add a little more glue here and there as you work, especially if it starts to dry out before your yarn reaches it. Alright! Let’s get some colour on that plate! Choose a colour to start with, and press the end of the yarn into the glue in the middle of the plate. 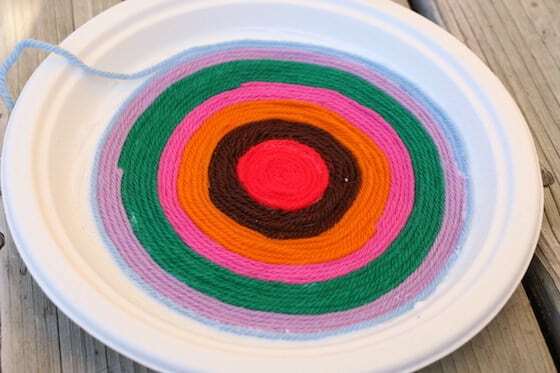 Now, simply start coiling your yarn around and around, working your way out toward the edge of the paper plate. 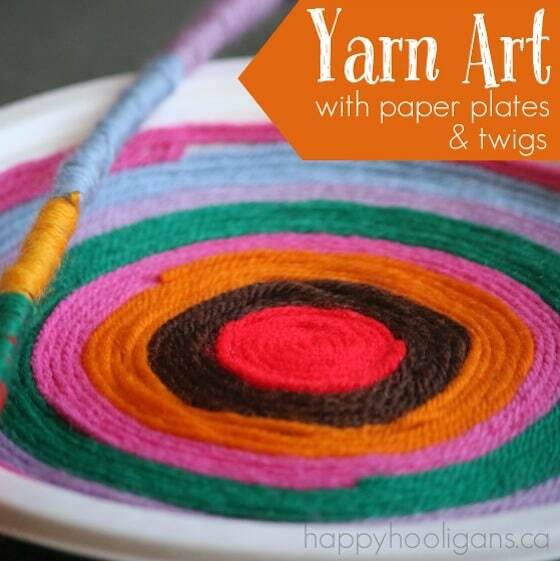 With your fingers, nudge your yarn up close to the previous coil so the paper plate doesn’t show through. Switch up your colours as often as you’d like. The more colours, the merrier! Each time you change yarn colours, simply start your next colour where your last one left off, gluing them together as if they were one continuous piece. I’ve chosen bright bold colours for my plate, but you could use several shades in the same colour family, or you could do all primary colours, or all pastels. It would be pretty to do all soft neutrals too. Keep winding and switching colours, until you’re happy with the way your art looks. Finish by cutting off the yarn, and gluing the end in place. Isn’t the end result beautiful? I love how primitive this design looks. Imagine what you could produce if you didn’t just stick to coils of yarn. You could create vibrant pictures and patterns! 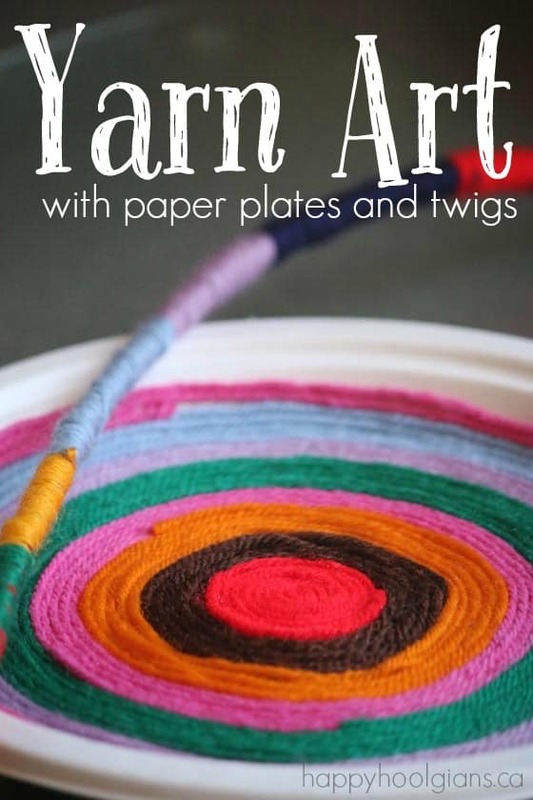 And what will we do with our paper plate yarn art? We could hang it on a wall our play room. We could punch holes around the bottom edge of the plate, and string seashells or beads from the plate. I was wondering if we could even use it as a hot-pad in the kitchen. 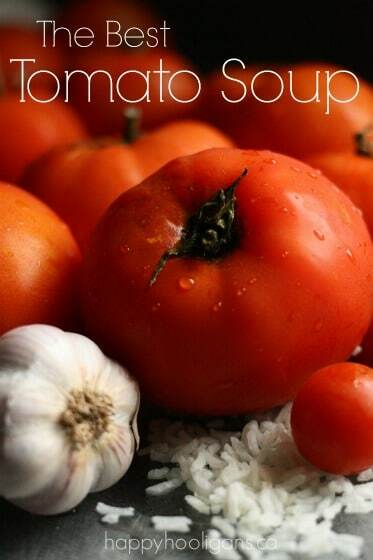 You know… instead of a pot holder. I haven’t tried that yet, but I might. If that worked, this might be a useful gift that kids could decorate and give at Christmas time! Meanwhile, check out all of these awesome yarn crafts over at Crafts by Amanda! 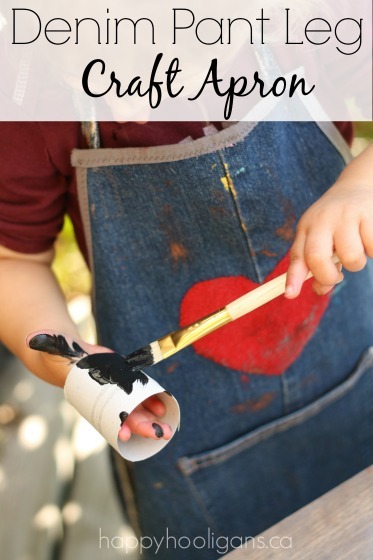 Previous Post: « Paper Plate Ice Cream Craft – “I” is for Ice Cream! When I go to visit family this season, I take books for gifts for the kiddos and also crafts. These are great ideas, I had never see the yarn art quite like this so I am going to take this idea and supplies on my road trip. The book I picked is Inspector Dewey by Kristen Heimerl, inspectordewey.com is her site. If anyone needs a good book for little ones, especially ones that like cats then this is a sure winner! Yay! I’m so glad you liked the idea, Heather! Thanks for the book recommendation! You’ve read my mind, Lucy! I’m already planning miniature versions of the paper plate craft as Christmas ornaments! Since making these, I want to wrap everything in yarn now! Hee hee! Glad you enjoyed this one!